Find artworks, auction results, sale prices and pictures of Anton Schranz at auctions worldwide. 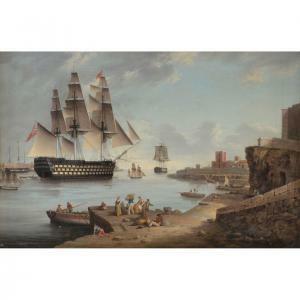 Anton Schranz (German 1769-1839) HMS Caledonia in Mahon; HMS Caledonia Leaving Mahon A pair Oil on canvas 41.5 x 62cm (16 1/4 x 24 1/2in.) 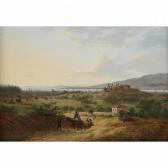 (2) Anton Schranz (1769-1839) father of the artist Giovanni Schranz (1794-1882), specialised in painting and engraving landscapes and seascapes, notably of Valetta in Malta. He lived most of his life in Minorca, where he produced similar compositions of Port Mahon, before moving to Malta in 1817. There he found patronage amongst British naval officers who bought his works as topographical souvenirs. Caledonia was in Mahon in August 1837. Although Schranz had moved to Malta by this time, as one of the most prolific marine painters in the area, it is possible that the present lot was actually painted in Malta. 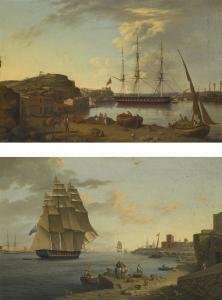 Caledonia had regularly been in Malta since 1834 suggesting it more than likely that the artist would have seen the ship firsthand. In addition, Schranz would have had a number of sketches and images of Mahon harbour from his time living there which he could have used for the background harbour composition. HMS Caledonia was a 120-gun first-rate ship of the line of the Royal Navy launched on 25 June 1808 at Plynouth. She was Admiral Pellews flagship in the Mediterranean. When completed in 1808, Caledonia entered Royal Navy service as the largest and most heavily armed vessel of the time. She proved to be a very successful ship, and it was said that 'This fine three-decker rides easy at her anchors, carries her lee ports well, rolls and pitches quite easy, generally carries her helm half a turn a-weather, steers, works and stays remarkably well, is a weatherly ship, and lies-to very close.' She was 'allowed by all hands to be faultless'. In later years she was to become the standard design for British three-deckers. On 12 February 1814 she took part with HMS Boyne in action against the French ship of the line Romulus off Toulon and later in 1831 she was part of the Experimental Squadron of the Channel Fleet under Sir Edward Codrington. On 12 September that year she took part in an experiment whereby she was towed by the frigate HMS Galatea by means of hand-worked paddles alone. In 1856 Caledonia was converted to a hospital ship and renamed Dreadnought, becoming the second floating Dreadnought Seamens Hospital at Greenwich where she remained until 1870. She was broken up in 1875. A BRITISH FRIGATE AT ANCHOR, PORT MAHON, MINORCA; A BRITISH FRIGATE LEAVING PORT MAHON, MINORCA Anton Schranz OCHSENHAUSEN 1769 - 1839 MALTA Quantity: 2 a pair, both oil on canvas the former: 40.5x 62.5 cm. ; 16 x 24 5/8 in; the latter: 38.5 x 61.5 cm. ; 15 1/4 x 24 1/4 in. Provenance Anonymous sale, London, Sotheby's, 10 November 1982, lots 5 and6. Literature E. Schneider, Anton Schranz (1769–1839): ein schwäbischer Maler aus Ochenhausen auf den Inseln Menorca und Malta, Munich 1985, reproduced. Catalogue Note Anton Schranz, father of the artist Giovanni, specialised in painting and engraving landscapes and seascapes, notably of Valetta in Malta. He lived most of his life in Minorca, where he produced similar compositions of Port Mahon, before moving to Malta in 1817. There he found patronage amongst British naval officers who bought his works as topographical souvenirs. Anton Schranz A BRITISH FRIGATE LEAVING PORT MAHON, MINORCA 1769-1839 oil on canvas 38.5 x 61.5 cm. ; 15 1/4 x 24 1/4 in. Provenance Anonymous sale, London, Sotheby's, 10 November 1982, lot 6. Literature E. Schneider, Anton Schranz (1769–1839) : ein schwäbischer Maler aus Ochenhausen auf den Inseln Menorca und Malta, Munich 1985, reproduced. Catalogue Note Anton Schranz, father of the artist Giovanni, specialised in painting and engraving landscapes and seascapes, notably of Valetta in Malta. He lived most of his life in Minorca, where he produced similar compositions of Port Mahon, before moving to Malta in 1817. There he found patronage amongst British naval officers who bought his works as topographical souvenirs. Anton Schranz (1769-1839) Austrian. 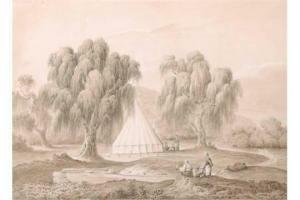 \‘The Eastern Source of the Bunarbashi Tchai\’\’\’\’, from sketches by T Spratt R.N., Watercolour, Inscribed on the reverse, Unframed, 9.5\” x 13.25\”, and the companion piece, \‘View of Bunarbashi from the Canal Bridge under Yerkasee Keui\’\’\’\’, a pair (2). Anton Schranz (Schrantz) of Malta (fl. 19th Century), German/MalteseVIEW ON THE ROAD FROM SMYRNA TO BOUDJA IN 1836; Oil on canvas; signed: "A. Schranz" lower left, signed, titled and dated 1836 at "Smyrna" and annotated by the artist: "for W. Talbot Rothwell" verso12.25" x 17.75" - 31.1 x 45.1 cm.Provenance: W. Talbot Rothwell, Smyrna direct from the artist in 1836Note: Athough this particular image is set on the Aegean Sea coast of modern day Turkey, this renowned family of painters, lead by Anton Schranz and his sons Giovanni and Anton Schranz Jr., were known primarily for their romantic depictions of early 19th century Malta and the raging Maltese seas. 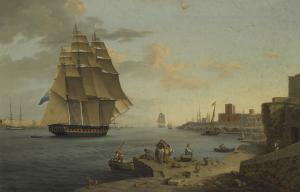 Their paintings were originally created as souvenirs for members of the navy and the British military stationed on the island and the burgeoning tourist market in 19th century Malta.